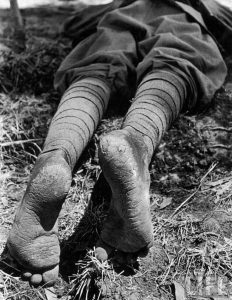 Feet of a resting soldier in Ethiopian Emperor Haile Selassie’s barefoot army that fought valiantly against Mussolini’s invasion of their country in 1935. Photo from LIFE magazine. Barefooters often get minor cracks or fissures in their heels or sometimes other parts of the soles of their feet. Most of the time these are very superficial and unless there’s an aesthetic concern, they do no harm at all. These minor fissures seem almost inevitable and can be observed in the feet of almost everyone around the world who never wears shoes. It most likely is a natural phenomenon, a process of excess dead skin layers being sloughed off. Cracks can also be observed in the feet of many animals. There is much speculation about the cause of these cracks. Weather conditions do seem to play a major role. I personally have noticed that I have more and larger cracks during cold weather or especially after spending much time walking barefoot in very cold and damp conditions. In the warm weather of summer, I almost never have any cracks of any significance in my soles. In conditions where cracks are more likely to develop, they can often be mitigated by the regular use of certain moisturizers or special products developed specifically for that purpose. More information on cracks and the prevention of cracks can be found on the FAQ page of the Society for Barefoot Living website. The purpose of this article is not to discuss all aspects of sole cracks, but only to offer a specific simple and quick remedy for cracks that have become deep enough to be painful. Occasionally a crack may actually become so deep in the epidermis (outer skin layer) that it’s open to or almost to the dermis, the next layer of skin. When that happens, you will likely start feeling some pain as put your weight on that area of the foot. If you carefully examine the crack and are able to pull it open a little, you may notice a pink color inside, as that will be very close to the blood supply. These could eventually heal up on their own without doing anything, but there’s always the chance they could pull open even further and begin to bleed – especially if you were to step down hard on a sharp rock or something similar when walking. From my own experience over many years as a fulltime barefooter, as well as from information gathered from others who have had the same experiences, I have found that a drop or two of regular household super glue applied to a crack can have an immediate beneficial effect. Within only a few minutes, the crack will be sealed enough at the outer layer of skin to prevent it from opening further as you walk and put your weight on it. That will prevent further dirt and debris from getting into it as it begins to heal from the inside. Super glue is made from cyanoacrylates, a family of strong fast-acting adhesives with industrial, medical, and household uses. The original patent for cyanoacrylate was filed in 1942 by the Goodrich Company. But it wasn’t until the 1960s that any practical use of the adhesive was developed. During the Vietnam War, it was found to be very useful as a way to quickly close wounds on the battlefield until the wounded soldiers could be brought to a hospital. In 2001, the FDA approved a special antibacterial version of super glue for medical use that would take the place of sutures for many types of surgeries. It went by the brand name Dermabond. Since then, its use has greatly increased in hospitals and doctor’s offices. Regular household super glue is not formulated to be antibacterial – that is, it doesn’t specifically kill germs – but there’s no evidence to suggest that bacteria could actually live or grow in it either. Nor does it absorb into the skin and certainly not into the bloodstream. But to minimize any chance for infection when sealing up cracks in the feet, it is important that the crack itself be completely clean before applying the glue. There have been some scientific studies done on the use of standard household type super glue for the purpose of treating cracks or fissures in heels and other parts of the foot. The most well known one was done in 1999, entitled “Superglue for the treatment of heel fissures,” by H. Hashimoto. It was published in the Journal of the American Podiatric Medical Association on August 1999, Vol. 89, No. 8, pp. 434-435. A case series involving 10 people with 14 heel cracks suggests that Super Glue may reduce pain and speed closure. Patients applied 2 to 3 drops of glue along the length of each crack and held the edges together for 60 seconds. After 5 to 7 days, 12 of the 14 cracks remained closed and pain free. Five patients from Temple Foot and Ankle Institute, Philadelphia, PA, with a total of eight heel fissures and two hallux (big toe) fissures, were studied. The hallux fissures and 4 of the heel fissures went to complete closure after 2 weeks. There was an average decrease of 1.16 cm in length of the heel fissure dimensions after 2 weeks and an average decrease of 1.1 cm in length of the hallux fissures. How do you apply super glue to a sole crack? Here are some specific guidelines for sealing up a sole crack with super glue. This is one of the super glue products that works well. Note, it shows “single-use,” but you can get many uses out of one of these small tubes as long as the tip is kept clean before replacing cap. Have ready a tube of super glue liquid, not gel. I have successfully used Loctite and Scotch brands. Thoroughly wash the crack and area around it with soap and warm water, preferably using a soft brush. Pat or spray with alcohol. That will help break down any possible residual oils left by the soap. Wait for a few minutes until you are sure the crack is completely dry. If practical, pull the skin back on both sides of the crack so it will open up as much as possible. Place the spout of the super glue tube directly on the crack and carefully squeeze out just barely enough to fill the crack. Alternatively, squeeze a few drops out onto a piece of paper or similar surface, dip the end of an opened paper clip in it, and carefully put glue into the crack with the paper clip. If you’ve held the crack open, release it now so the edges will naturally come back together. Leave it alone for about at least 10 minutes while the glue sets up. Rest your foot while it sets up in such a way that there’s no tension at all that would pull the crack back open before the glue sets up. After that period of time, you should be able to walk around and the glue will hold. However, since super glue normally takes about 24 hours to reach its absolute maximum strength, you may want to be careful about walking on gravel or sharp rocks right away. 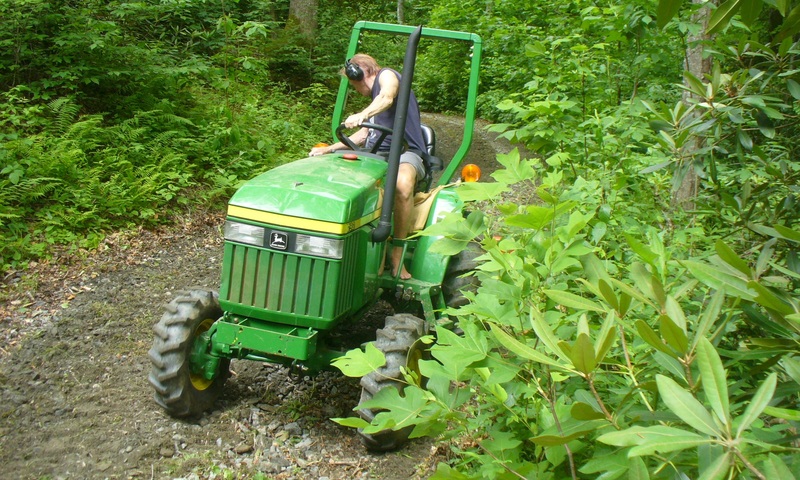 If you will be walking on rough ground right away, it may be wise to temporarily apply a small piece of tape (medical or duct tape) directly over the just glued crack. Remove it later before taking a shower or bath. At the end of the day or the next morning, check the crack to make sure it’s still holding closed with the glue. In the unlikely case that it somehow pulled open, repeat the above process. Some minor heel cracks before and after gluing. That’s it. Remember, this procedure is only for deep cracks that have become painful to walk on. It is not for ordinary cuts or scrapes, nor is it for any crack that may actually be bleeding. A crack that is bleeding needs to be treated as any other wound would be treated. This is also not intended to be medical advice, so any crack, cut, sore, or other wound on your foot that you aren’t sure about the proper treatment should be referred to a medical doctor.